The name Jun Shan Jin Zhuan means "Golden Brick from Mount Jun". 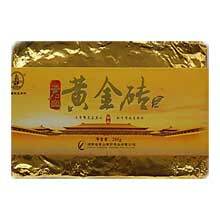 This tea was created by Jun Shan Tea Company after the success of Jun Shan Jin Bi tea. The tea is compressed into the shape of brick and wrapped in gold foil and each tea brick is personnally made by Jun Shan Tea Company's yellow-tea master, Mr. Gao Xiao Zhu. Jun Shan Jin Zhuan tea is made using tea leaves that were picked from Mount Jun, and is the same tea leaves that are used to make the famous Jun Shan Yin Zhen tea. The processing of this tea involves using both Yellow tea and Pu-erh tea processing technique. According to Jun Shan Yin Zhen Tea Co. Ltd., Jun Shan Jin Zhuan shares the special property of Pu-erh tea in that the tea improves with age. The brick form makes it suitable for storing and aging. The fragance of the dried tea leaves is out of this world - it is strong and smells wonderfully sweet and minty. The tea taste minty with a hint of nutty fragrance and the aftertaste gradually feels stronger after a few sips. This is really a special tea that is quite different from the rest. The tea leaves are compressed into the shape of a brick and wrapped in golden foil paper. The golden brown tea leaves and buds are of high quality. The infusion is golden brown in color.